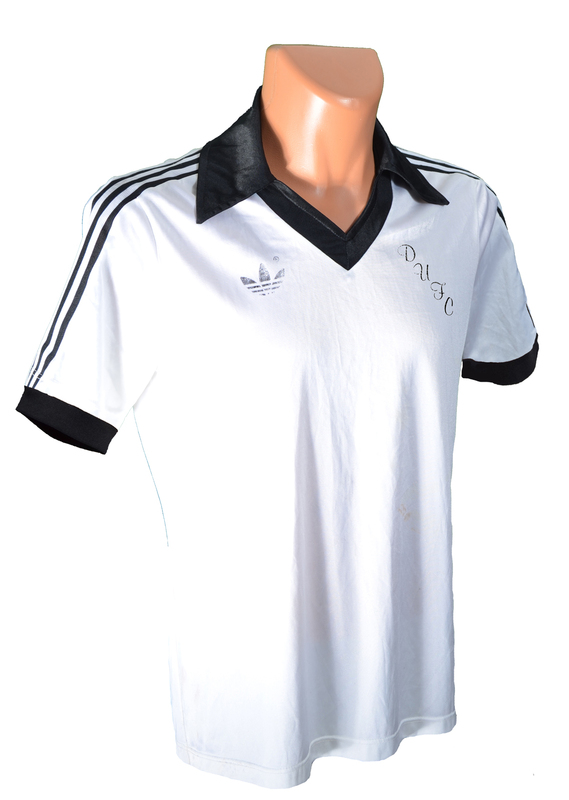 There was only a slight modification from the 1977/78 Adidas kit to the one that was worn from 1978/79 - the horizontal "DUFC" badge design returned to the diagonal text that had been on the shirt from 1973 to 1977. Other wise the white polyester shirt was exactly the same, with the black collar with lapels, and the famous three stripes down the sleeves to the cuffs. The Adidas logo now also had the firms name under its logo. The black shorts had three Adidas white stripes down each side, and the Adidas logo on the bottom left. The white socks were topped with three black stripes on the turnover. This version of the Away kit was worn for five seasons, during the Clubs most successful spell as they followed up two League Cup victories with the Premier Division Championship in 1983.